Startup of a local potter! Check out this local potter! This week is featuring a small business in Chattanooga once again. I met Tori three years ago when she interned on our startup farm and she made our first season a success. 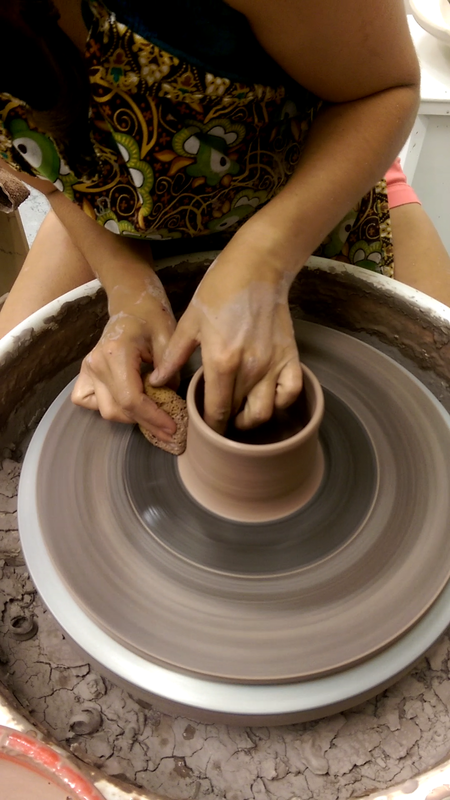 She's talented and passionate and has recently started her own pottery business! What is Two Ridges Pottery? Two Ridges Pottery (TRP) is a small one-potter business here in the Chattanooga area that was born out of desire to create beautiful, functional pottery for everyday use. My name is Tori and I am the potter at Two Ridges Pottery, but I wouldn’t be pursuing a career in ceramics without the faithful support and inspiration from my husband, Christopher. “Nature-inspired ceramic essentials” is our motto. We strive for all our pieces to be miniature reflections of the natural beauty, simplicity, and wonder around us in the world, and to serve as daily bringers of joy and to fulfill a practical purpose. When did you get started in pottery? My first memory is being in second grade and getting my hands into clay for the very first time during an art class at school, we made teeny pinch pots. Through the years of art classes, I became more interested in and drawn to making pottery, which led me to take a focussed ceramics class during my senior year of high school (2014). I made a weeping willow and earthy blue theme 50 piece dinnerware set—it’s what my family still uses regularly for dinners! Sadly, being so busy with college I didn’t have an opportunity to take any ceramic classes or even throw on a wheel at all. But just before graduating in May of 2018, I got a part time job at a ceramics gallery in downtown Chattanooga. This job has given me the ability to learn to throw again, soak up new techniques and skills, and to meet many of the potters in the area. It’s here that I began making my own work and lead me to starting TRP. Have you always lived in Chattanooga? I’m originally from Asheville, NC in the beautiful Blue Ridge Mountains and moved here to Lookout Mountain, GA when I started school at Covenant College. Christopher and I have really enjoyed living here in the Chattanooga area and hope to stick around for a good while, even though we miss being in the (real) mountains. How has the community impacted you? Coming here for Covenant, most of my community has been Covenant students and my church at New City, East Lake. I’ve worked at three farms in the area, including Natural Ways Homestead, and have found myself deeply impacted by the local food movement and by the farmers’ resilient, down-to-earth approach to living life. I think starting a pottery business can sound like a crazy idea, like just another artist who’s going to be scraping by financially if they’re lucky. But seeing local farms start from scratch and be able to make it, not only financially but relationally and finding great joy in their lifestyles has really inspired and encouraged me. Having a community of like-minded people who appreciate and strive to take care of the earth through honest, whole living is such a gift to me as an individual and as a potter. As a small business owner what are some of the hardest things you have come up against? Honestly, it’s marketing. I don’t have a business or marketing education or experience, and the whole realm of getting your name out there and using social media well, advertising, etc is pretty foreign and daunting to me. It’s hard to reach out beyond friends and family and acquaintances that I already know in order to build a customer base and market for my work since I have no ‘know how’ in this area. Talking with other potters and small business owners, listening to entrepreneur podcasts, and doing research is what I’m doing to counter this difficulty. What are some of the greatest joys that you have experienced doing what you do? Believe it or not, the entire process of making a piece. Starting with a 25lb bag of clay and finishing with a unique, handcrafted piece of functional art is empowering and full of hope at each stage: Wedging the clay, throwing it into a form, adding carvings or handles, firing it once, glazing it, and firing it again, and finally unloading the finished product from the kiln. I also find a lot of joy and reward in seeing my work being used by others. Like a customer telling me that they drink their morning coffee out of my mug every single day. Or a newlywed couple sending me pictures of their first meal in their new home served on my dinnerware. Bring able to bring a little bit of beauty, handmade simplicity and a reminder of the good earth around us into others’ daily life routines is very meaningful to me. What’s your favorite pottery artist that you like or follow their work? I wouldn’t say that there’s just one, rather many who have given me inspiration for my work, either in technique or the personality of their business or the style of work. A friend of mine from Covenant, @bluetartanpottery has given me a lot of encouragement in starting out. The two potters @anniehanksceramics here in Chattanooga have given me support as a young female potter and provided advice and a listening ear, even in the short time I’ve spent with them. I really like the work of @tamarabpottery though have not yet met her—just seen her work on Instagram. She uses neat nature inspired pottery involving pressing plant leaves and patterns into her pots—I appreciate her value of plants beauty! Her awesome Etsy page is here. Newer PostThe future of the farm!